Warmed up basic boxing and developed a multi-angle flurry: J-C-LU-O-LH-C. This round we worked boxing and the entrance to work focus mitt pummeling drills. Continuing off the previous round the knee is used to clinch (i.e. pummeling and takedown) or skip knees (3 knees turn until throw to kick range). With this round after each combination the hitter creates space and throws a tiip as the holder re-closes distance. The objective is to generate a good defense by developing a better offense. We finished with 2 x 5 minute of combat sports Tabata protocol conditioning. We added "Sprawl n' Fall" as well as "Fall n' Follow" (first fall to back, kick up, three punches, holder falls, follow to ground with three punches). 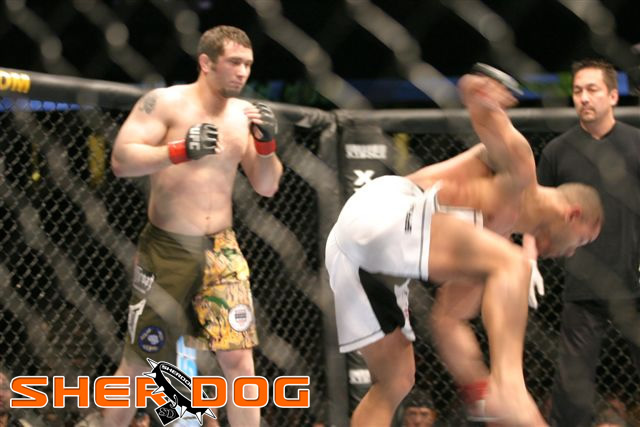 Derrick Noble squares off with Thaigo Alves at UFC 59. Although Noble came out strong Alves was able to recover and pull out the win. I just like Derrick's shorts =D.